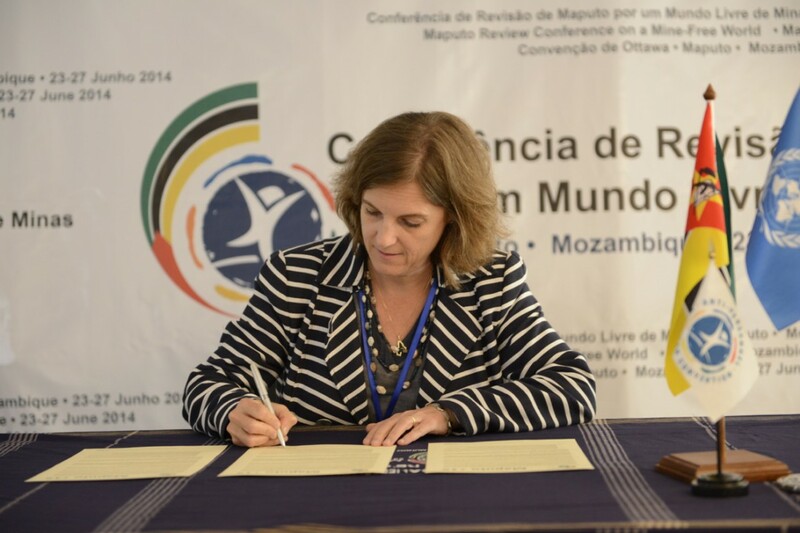 Representative of Canada signing the Maputo +15 Declaration at the Third Review Conference of the Ottawa Treaty, 27 June 2014. ©Mine Ban Treaty’s ISU. Despite it being the home of the Mine Ban Treaty (and also known as the Ottawa Convention), Canada is not normally listed amongst countries actively engaged in victim assistance with its citizens. Canada has some residual UXO contamination, as well as many military personnel and peacekeepers who have served in mine and UXO contaminated areas, but such issues are rarely contemplated publically. Recently that changed. A widely watched alternative news show used its weekly ‘Rant’ segment to break the news that Canadian veterans with disabilities had to prove to the Department of Veterans Affairs that their injuries had caused permanent impairments annually, surprisingly even in the case of limbs lost to landmines and IEDs. This bizarre process is required for continued government support. The Monitor does not have an official number of landmine survivors amongst the Canadian veterans affected by that policy; media reports indicate there are at least 22 Canadian veterans who were injured by landmines or victim-activated IEDs in Afghanistan, but we expect the actual figure to be higher. The news that veterans had to annually prove the inevitable, that their permanent impairments persisted resulted in nationwide outrage. So on February 27, 2015, the government released a new policy saying that veterans would only have to verify their injuries every three years instead of annually. This new policy is still very problematic from a victim assistance perspective. Victim assistance at its most basic is grounded in the principles of human rights and the inherent dignity of all of humanity. Requiring a reassessment and new medical letter indicating that amputated limbs are still missing to justify continued assistance with mobility devices and other services could be perceived as an outrage to the dignity of survivors—regardless of whether that letter is required annually or every three years. In addition, the process of proving permanent injuries continue to exist forces survivors to relive their loss in a way that may be seen as needing to justify their rights, which may be psychologically stressful or traumatic. This policy places a barrier to accessing services that is especially concerning considering that Canada and all States Parties to the Ottawa Treaty agreed to “increase availability of and accessibility to appropriate comprehensive rehabilitation services” for all landmine victims in the Maputo Action Plan. In addition, this situation raises concerns about discrimination as other Canadians with disabilities do not have to prove their impairments annually. Overall, this policy is immensely concerning and it runs counter to the global shift away from a medical approach to disability and into a social and human rights based approach. The initial media ‘Rant’ about this issue reminded the public about an ongoing court case where the government is saying that there is no “sacred obligation” to Canada’s veterans. I do not know how the court will rule on the government’s obligation to veterans, but I do know that together with most of the states of the world, Canada has made specific serious commitments under the Mine Ban Treaty and its associated action plans, not to mention moral obligations to all landmine victims living here including veterans. With this disability verification policy in place, there are serious questions about whether or not Canada is living up to its victim assistance obligations with regard to veterans injured by landmines and victim-activated IEDs, their families and local communities. Although Canada does not have many landmine victims, the survivors here deserve to have their rights respected and their needs met. At the moment, that is not happening for a significant portion of them. There are other countries where this process may occur that have significant numbers of survivors and veterans with disabilities but campaigners and donors have expressed concern about such policies and called for changes to the process. Canada may not be the only country that has a process like this but with a relatively small number of survivors and veterans with disabilities, Canada is well-placed to make a difference at home and internationally by finding a different approach to providing services to survivors.